Tennessee Gov. 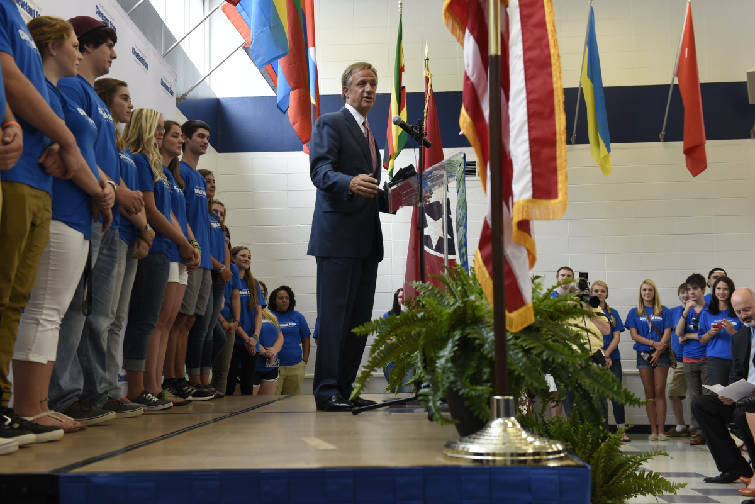 Bill Haslam speaks as he visits the Cleveland State Community College campus on Aug. 24. Tennessee Gov. Bill Haslam speaks as he visits the Cleveland State Community College campus on Aug. 24. The students on stage with the governor are Tennessee Promise honor students. The promise Gov. Bill Haslam made to Tennessee students is changing the landscape of higher education in the Chattanooga area. 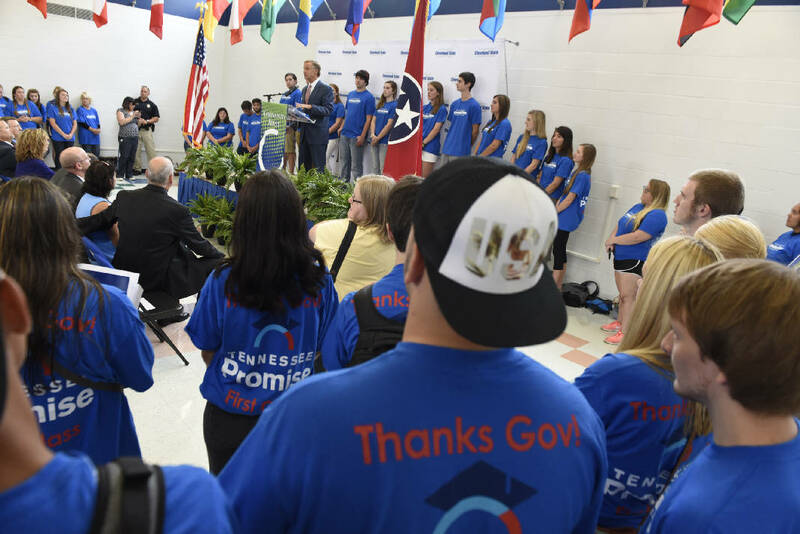 Both Chattanooga State Community College and Cleveland State Community College are seeing a dramatic uptick in freshman enrollment, as a result of the governor's Tennessee Promise program, signed into law last spring. But the University of Tennessee at Chattanooga's freshman class enrollment has atrophied, prompting university leaders to adjust their recruiting strategy. Tennessee Promise offers high school graduates a free two-year degree from any of the state's 13 community colleges, 27 colleges of applied technology or any eligible institution offering an associate's degree program. This "last dollar" scholarship leverages Tennessee Lottery money to foot the bill for tuition and fees not paid by other state and federal programs. The scholarship program spurred Ooletewah High School graduate Travis Stutz to enroll in the Tennessee College of Applied Technology at Chattanooga State. "I didn't think college was for me," said Stutz. "But now it'll be totally worth it." The program is allowing Stutz to earn a machinery degree at no cost, which he hopes will allow him to hold a higher-level, better-paying position than his current job at a sheet metal factory, he said. The scholarship is a key piece of Haslam's "Drive to 55" initiative, which aims to boost the rate of college graduates in Tennessee from 32 to 55 percent by 2025. Tennessee Promise aims to remove financial barriers preventing students, particularly first-generation college students, from earning degrees and entering the workforce. College officials across the state said they were unsure how Tennessee Promise would affect this fall's enrollment. "It's hard to say what we anticipated," said Michael Stokes, vice-president of student affairs at Cleveland State. But based on the first year, he said, officials expect "we will maintain these high enrollment numbers and even grow in the future [because of Tennessee Promise.]" Statewide, community college enrollment is up 14 percent. The number of recent high school graduates enrolled this year compared to last at Cleveland State is up by about 17 percent; and Chattanooga State is experiencing a swell of about 60 percent. But UTC's freshman class of recent high school graduates is about 290 students — 13 percent smaller than last year's. "I don't know if anyone knew what to really to expect from this big change [created by Tennessee Promise]," said Yancy Freeman, assistant provost for enrollment services at UTC. "We anticipated a decrease in the number [of freshmen], but it was really hard to tell." Freeman said UTC is having to rethink its recruitment strategy. "It's tough competing against free," he said. But Mike Krause, executive director of Tennessee Promise, said the program could channel student to universities. "There is a huge opportunity for four-year universities to get these Tennessee Promise students in three years," he said. Not all Tennessee universities are seeing a decrease in enrollment. UT's Knoxville campus, for example, saw an increase, Krause said. Enrollment goes through cycles, he said. At UTC, Freeman said officials are hoping many Tennessee Promise students at Chatt State and Cleveland State will enroll at UTC to complete a baccalaureate degree, as historically these schools feed the largest number of transfer students to the university. "We are shoring up partnerships to make sure that the transition [for community college students into UTC] is smooth," Freeman said. UTC also is changing the way it recruits current high school students. "We have to be a lot more vocal and a lot more strategic about how we promote the four-year experience," Freeman said. "It's a different experience than you would have at the traditional community college." The university is encouraged by its retention rate, which has grown by 9.5 percent in the past six years. He said keeping retention high, recruiting transfer students and growing the school's graduate programs are ways to offset the effects of a smaller freshman class. And even though UTC's enrollment took a hit, Freeman said university officials are proud of Tennessee for encouraging students to pursue higher education, and the university sees "a lot of opportunity as we go forward, and really good challenges." Sidney McFee, president of Middle Tennessee State University, said the school has been forming partnerships with community colleges for five or six years to recruit transfer students. This investment is the reason MTSU recruits the most transfer students of any university in the state, he said. "We are now seeing the fruits of our labor," McFee said. "We are in a good position to catch [transfer] students." First-year freshman enrollment at MTSU slipped by 4 percent this fall, but was offset by the transfer rate increasing 12 percent this year, according to McFee. Officials at Cleveland State and Chatt State said they are thankful for the dual agreements allowing their students to transfer into schools like UTC and MTSU. Now they'll focus on retaining Tennessee Promise students and helping them achieve the governor's goal of watching them graduate with a degree in two years. Ryan Thomas is the program coordinator for Cleveland State's First-Year-Seminar, a required class for first-time college students. The course offers tips and study strategies to help students succeed in college courses. Chatt State has a similar program called Student Success. Thomas said he is encouraged by the enrollment numbers and hopes they remain constant, but he also knows there's typically a drop later in the semester. He said he hopes the support given to Tennessee Promise students will allow them to graduate with an associate's degree and be prepared to enter the workforce or continue their education at a university. Many Tennessee Promise students were not planning to attend college, but the scholarship gave them the opportunity, Krause said. "We are seeing a change in higher education in the way students look at their futures," Krause said. "There is a tangible feeling on college campuses across the state of excitement and new opportunities." Ben Galvez, an East Hamilton High School alumnus, said he didn't plan on attending college. He always expected that after graduation he'd get a job in the food industry or in a factory — until he heard about Tennessee Promise. "I wanted to take advantage of this opportunity," Galvez said. "I knew it would help me find a better job." And the Tennessee Promise scholarship also influenced Mikala Fenzlaff's decision to attend Chatt State. Fenzlaff knew when she graduated from Centennial High School outside Nashville that she wanted to earn a four-year degree, but the cost was daunting. When Tennessee Promise was announced she decided to earn a free associate's degree in health science at Chatt State before she completes her degree at UTC. "I'm really grateful that I did this," Fenzlaff said. "It prepares me to go to a university." Nancy Patterson, vice president for college advancement and public relations, said Chatt State is proud to be Chattanooga's community college and a part of the governor's plan for workforce development. "The Tennessee Promise scholarship offers all types of students success," Patterson said. "Ben [Galvez] wanting to enter the workforce after this degree is success, and Mikala [Fenzlaff] attending UTC when she is done here is just wonderful."